A few weeks ago I posted my recipe for cheese-less noodle-less lasagne using zucchini slices as noodles. Yum yum yum! I wasn’t sure how much zucchini I was going to need though so I was left with this extra zucchini in the fridge and wasn’t sure what to do with it. 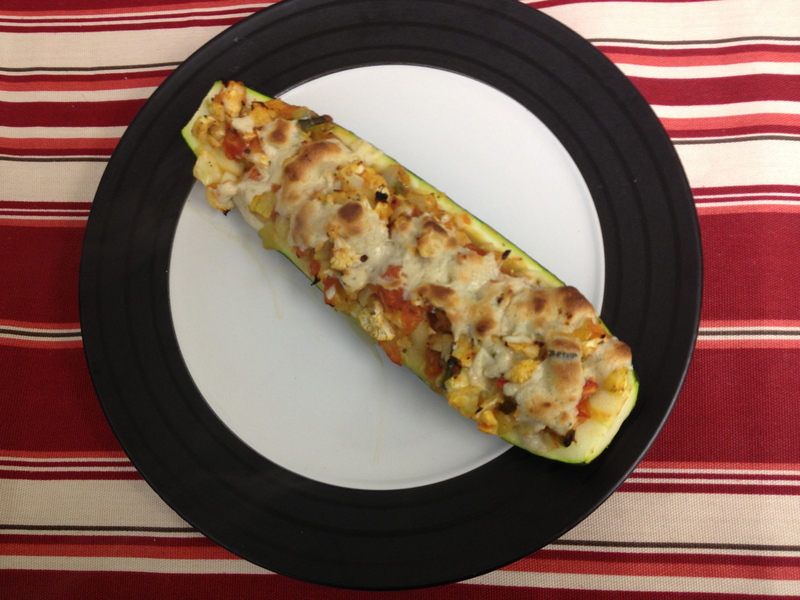 I decided to get inventive and make a vegan stuffed zucchini dish. I was a little nervous about how it was going to turn out, but oh my was it good! I also feel like it is the kind of recipe which you could easily modify depending on what vegetables happened to be in the fridge that day. Obviously, sharing was in order. Cut the zucchini lengthwise. With a spoon scoop out the seed portion of the zucchini to create a hollow bowl. Dice the scooped out zucchini, tomato, onion, red pepper and cauliflower.In a large frying pan heat the olive oil on medium heat and add the diced vegetables, basil, salt and pepper. Sautee the vegetables until the onions are caramelized and removed from heat. Spoon the sautéed mixture into the zucchini bowls. If desired crumble the vegan cheese on top. Place the stuffed zucchinis on a non-stick baking sheet and bake in the oven for 15-20 minutes. If using vegan cheese watch it carefully so that it doesn’t burn. Tada! A hearty, yummy, vegan dinner!